Most of us do not believe in aliens but looking at this strange fossil might just make you stop and think. This relic is in fact the ancient fossil that inspired the extra-terrestrial antagonists in Ridley Scott’s classic sci-fi horror, Alien. 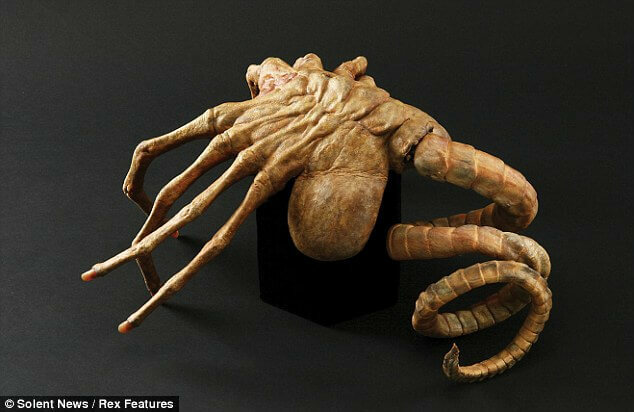 The creator of Alien was Swiss surrealist artist, Hans Rudolf Giger, who was sought out by Ridley Scott to design the creatures after he saw Giger’s artwork Necronom IV, one among his many designs that are said to have been based on the fossils. Mr Giger’s designs – one of which was all too memorably seen bursting out of a character’s chest on screen – went on to win his team an Academy Award for Best Achievement for Visual Effects on the 1979 film and the franchise that followed. But the stranger than fiction fossil is actually the remains of an early form of life that existed on our own planet an incredible 300 million years ago. And the extremely rare fossil captured the public imagination so much when it went on display in Switzerland that it not only attracted plenty of visitors, it also tempted a thief. Police believe the thief – who broke into the case and stole the Aathal dinosaur museum’s prize exhibit – is a fossil collector. Last week police released the photo in a bid to find the exhibit and track down whoever who took it. And now the priceless piece has been returned after it was put into the museum’s post box tucked inside a padded envelope. Museum curator Dr. Thomas Bolliger said: ‘It was comparatively undamaged – although one of the arms had broken off.